A store overview of Launderland, Los Angeles. LOS ANGELES — Jason Arrow purchased and fully renovated his first dilapidated vended laundry in 2013. Three years later, he owns five retooled Los Angeles stores, three of which are located on the same bustling thoroughfare — Pico Boulevard. 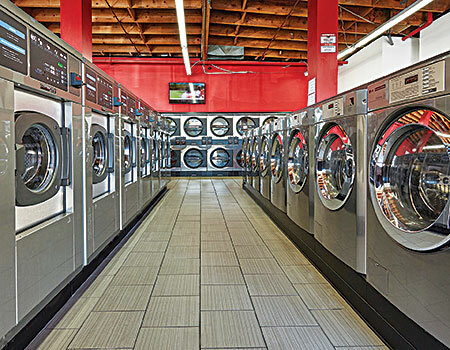 The Laundry Lounge, Western Laundry and Launderland — “the trio on Pico” — tout high-efficiency Continental Girbau washers and dryers boasting five to seven turns per day. Low utility costs, strong customer turnover and an ESD card system contribute to solid profitability and ease of management. Arrow acquired his first store with a $250,000 investment. He fixed it up and immediately flipped it in order to purchase and retool larger stores requiring a greater capital outlay. Qualifying an existing laundry is easier if you work with an experienced broker or distributor, according to Arrow. He’s partnered with Dang since the get-go. A 30-year vended laundry veteran, Dang works alongside his wife, Carol, and a team of laundry experts to bring vended laundry owners, sellers and buyers together. Elite specializes in brokering and renovating existing laundries. In all of Arrow’s laundry acquisitions, Dang qualified store viability and negotiated leases prior to the sale. He also recommended laundry equipment, card systems and cosmetic upgrades, while overseeing much of the installation and construction. “David held my hand through the process and was involved in everything related to vended laundry renovation and operation,” says Arrow. 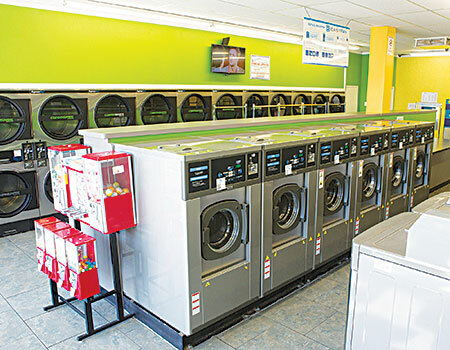 Additionally, through the guidance of Elite, distributor Continental Girbau West, Santa Fe Springs, Calif., provided the high-efficiency Continental laundry equipment, which ultimately gleaned lower store overhead costs and catapulted revenue. CG West provides ongoing technical service and training to Arrow, as needed. All of Arrow’s Continental laundries are fully attended, deliver full-service wash-dry-fold and attract customers with free Wi-Fi, vending machines, friendly staff and several HD TVs. Customers, who appreciate a daily free dry, use loyalty cards to operate equipment. Competition, population density, lease details and parking are critical considerations for vended laundry investors, according to Arrow. His three Continental vended laundries are located seven miles apart, yet serve extremely different clientele. “The biggest thing I look for is density, income spread and the break-even point,” says Arrow. Launderland is located in an area where a family’s average income is $25,000. At the end of the street, Laundry Lounge sits where a family’s average income is $1 million. Each laundry touts a Continental equipment mix to suit its size and clientele, including 25- to 75-pound-capacity washers, 30- to 45-pound-capacity stack dryers, and 75-pound-capacity single-pocket dryers. When it comes to retooling a laundry, Arrow first evaluates the condition and efficiency of the laundry equipment. The Continental washers offer a sump-less design — saving up to 3 gallons of water per fill. A brand-exclusive AquaFall system further lowers water usage and improves wash quality by releasing water through holes in the drum lifters for better saturation and rinsing. Finally, an AquaMixer system, a hot- and cold-water mixer, reaches precise bath temperatures for optimum temperature management and lower hot-water usage. “At Laundry Lounge, I doubled my gross income and cut water usage in half just by replacing the existing equipment,” says Arrow. Prior to retooling, utility costs were 30% of revenue. Now, thanks to the Continental washers and dryers, utilities make up only 15-17%. The washers also feature the new ProfitPlus® Control, which works seamlessly with card technology and offers more owner programmability and washing options to Arrow’s customers. Customers choose from three standard cycle options, plus can select others for greater washing customization. Meanwhile, each cycle is individually modifiable by Arrow so he can program G-force extract, mechanical action, wash temperature by degree, water levels and wash/rinse/extract time in each phase. The control’s flexibility allows multi-level vend pricing on the same machine depending on the wash program selected, time of day, or day of the week. Continental’s serial communication and the ESD card system allow Arrow to manage his laundries from a smartphone or computer, via the Internet. He can reissue loyalty cards, run specials, change vend prices, program machines and refund customers remotely. He tracks overall income and the breakdown machine usage; the 20s, 40s and 55s are his stores’ most popular washers. At his larger, 4,000-4,500-square-foot laundries (Laundry Lounge and Launderland), machines turn an average 10-11 times per day on weekends. For investors looking to get into the business, Arrow recommends talking to owners of small and large stores.